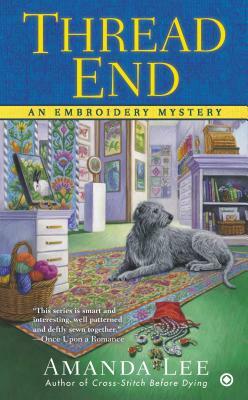 Amanda Lee is a full-time cozy mystery writer and author of three cozy mystery series: the Myrtle Crumb mysteries, including When Good Bras Go Bad and Claus of Death; the Daphne Martin Cake mysteries, including Dead Pan, Killer Sweet Tooth, and Battered to Death; and the Embroidery mysteries, including The Long Stitch Good Night, Thread on Arrival, and Cross-Stitch Before Dying. She is married and has two gorgeous children. Like Marcy, she enjoys needlecrafts and pop culture.